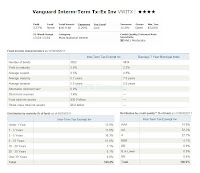 Vanguard Intermediate Term Tax Exempt fund (VWITX) is top muni bond mutual fund. Municipal bond mutual fund can be attractive if you are on higher income tax rate. The income from this fund is tax free from federal tax rate (possibly states tax and local tax). One of the popular muni bond funds is Vanguard Intermediate Term Tax Exempt Fund. Below is the fund’s review. 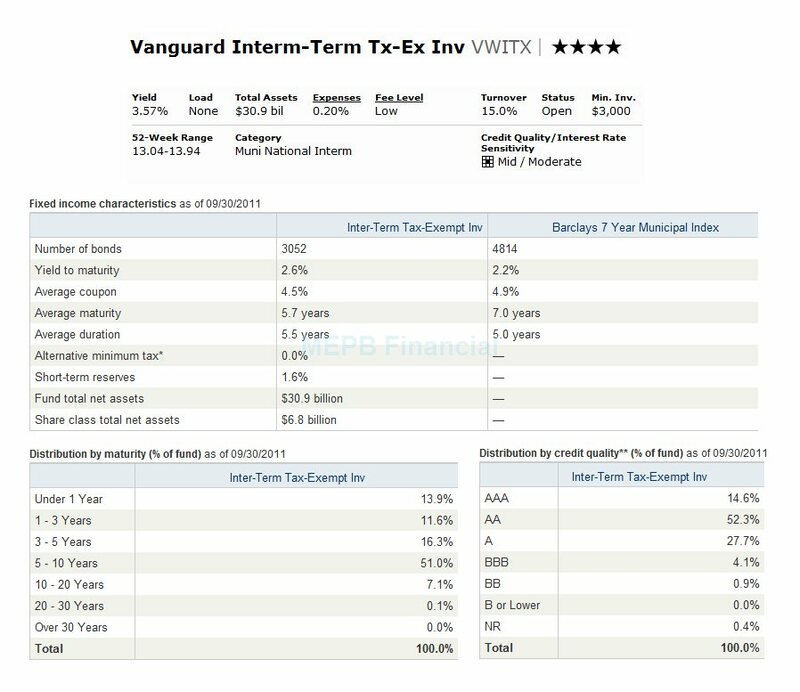 The Vanguard Intermediate Term Tax Exempt Fund invests mainly (>75% of assets) in investment grade rated municipal bonds. It may also small part of its assets (<25%) in high yield municipal bonds (junk rated). As any muni bond fund, this fund’s objective is to offer moderate and sustainable current income that is not subjected to federal personal income taxes. This fund is actively managed by Michael G. Kobs since 2008. The after tax yield is 3.57%. This Vanguard fund also has $30.88 Billion of assets. It also has a low turnover rate of 20%. The annual expense ratio of this investor shares is 0.20%. There is no sales load and no 12b1 fee. This Muni Bond fund is rated 4 Stars rating by Morningstar. The fund was used to be managed by Christopher Ryon. Ryon left this top rated muni bond fund in 2007 after a 16-year as the fund manager. The fund has returned 3.35% over the past one year, 7.07% over the past 3 year, and 4.72% over the past 5 year. Another class of ticker, VWIUX (admiral shares), has a lower expense ratio of 0.12% only. The worst 1 year total return was in 1999 with -0.50% and the best 1 year total return was in 2009 with 10.22%. As of October 2011, there are 3052 bonds in its holding. The fund’s yield to maturity is 2.6%. The fund’s average duration is 5.5 years and the average maturity is 5.7 years. This top rated muni bond fund benchmarks are Barclays Capital 7 year Municipal Bond index and Barclays Capital Municipal Bond Index. Investing in this best municipal bond fund involves risks such as income risk, call risk, interest rate risk, credit risk, management risk, and liquidity risk.